This past August (yes, five months ago!) 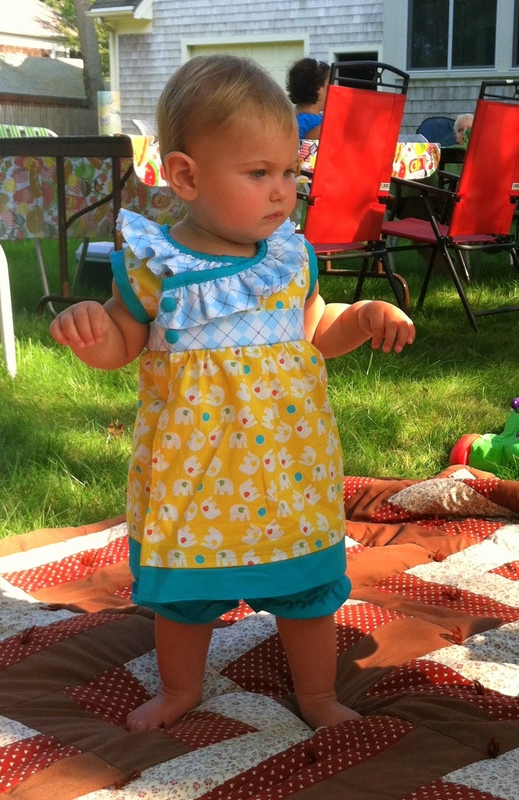 I made a dress for Bean to wear to our family BBQ. 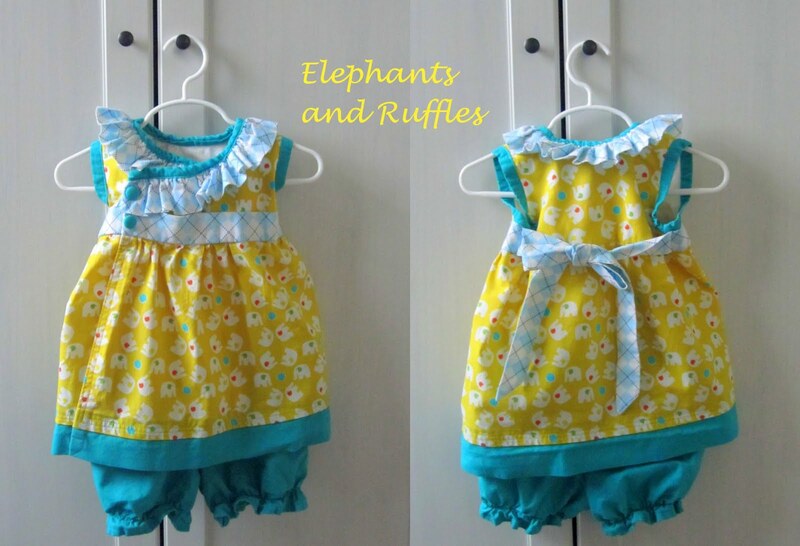 I’ve been meaning to post the pictures here and since the previous elephant dress post got lots of color combo praise I figured it was time. 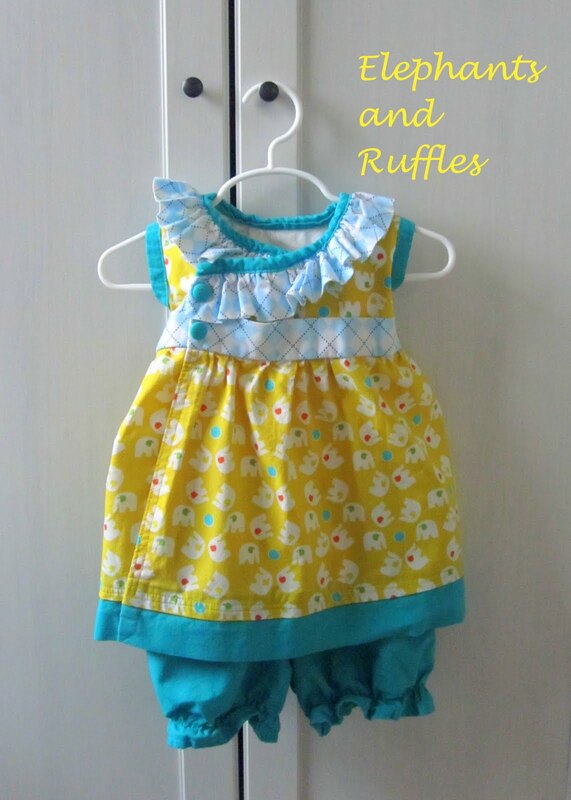 I knew it needed lots of ruffles and mixed patterned fabrics. At the time I was interested in seeing how mismatched patterns would look once put together. The argyle fabric I instantly fell in love with. And who doesn’t love elephants? Then to tie them together I found a linen-ish green-ish blue solid color which matched one of the ball colors in the elephant fabric. 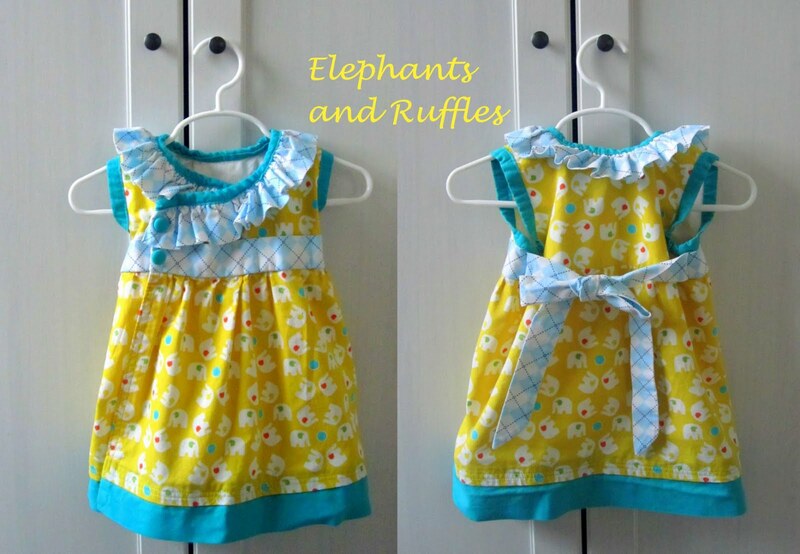 I almost used the orange elephant fabric for this dress, but last minute thought the yellow was more summery. Now that I’ve see both fabrics in use I am definitely happy with the decision. I love both combos, but they have a seasonal feel to me that seems to work. Once I figured out the fabrics I wanted to work with, I went looking for inspiration. I found it (and a tutorial!) in the Madelyn Dress. I loved the look right away. The wrap with ruffles is adorable and I thought it would work well with my fabrics. I didn’t really use the tutorial since some of the ways she sewed it together didn’t make sense in my brain, but it came out almost exactly the same. The only real thing I changed was the length. I like Bean’s dresses a little shorter. 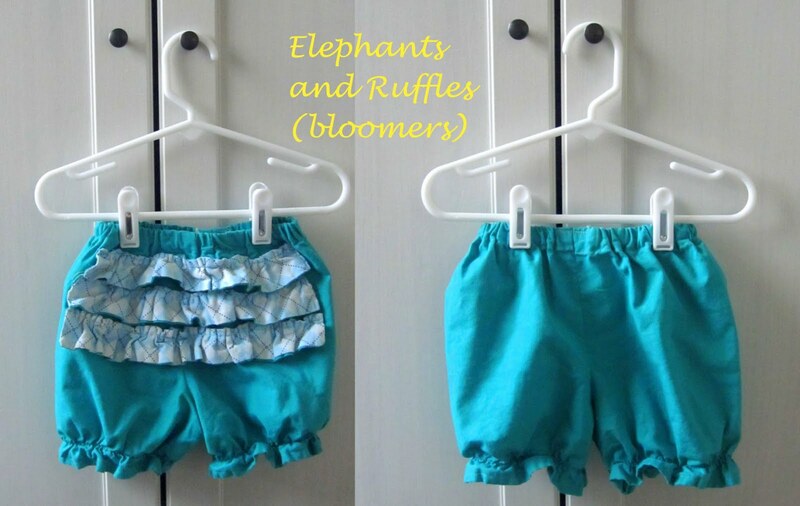 I thought it would be cute with a pair of bloomers so I just used an old bloomer pattern I drafted and added ruffles. My favorite is the elastic ruffle at the leg. I love this look! Will she be too old to wear this type of thing next summer at two years old? I hope not. This is a picture I took at the BBQ. Look how young she looks, hehe. She had just started taking a few steps and you can tell she’s unsure of her skills by her arms in this pic. I put this outfit back on her yesterday and it still fits, but you see WAY more of the bloomers now – like a shorts and shirt outfit. We also had the opportunity in September to meet with Kelly Crawford for a photo session. I was VERY excited about this, because I have followed her blog (sewing in no man’s land) for so long and I adore her photos. She has a way of capturing eyes and expressions that I think is so lovely. At the very end of the session Kelly saw that I had brought this little outfit and said we HAD to get some pics of Bean wearing it. It was hot and Bean was getting a little tired, but she did a great job and Kelly got some amazing pictures. We love hiking so the session was set up at a trail head nearby. Bean was not actually hiking, though it kind of looks like she’s been out walking in a fancy outfit for hours hehe. 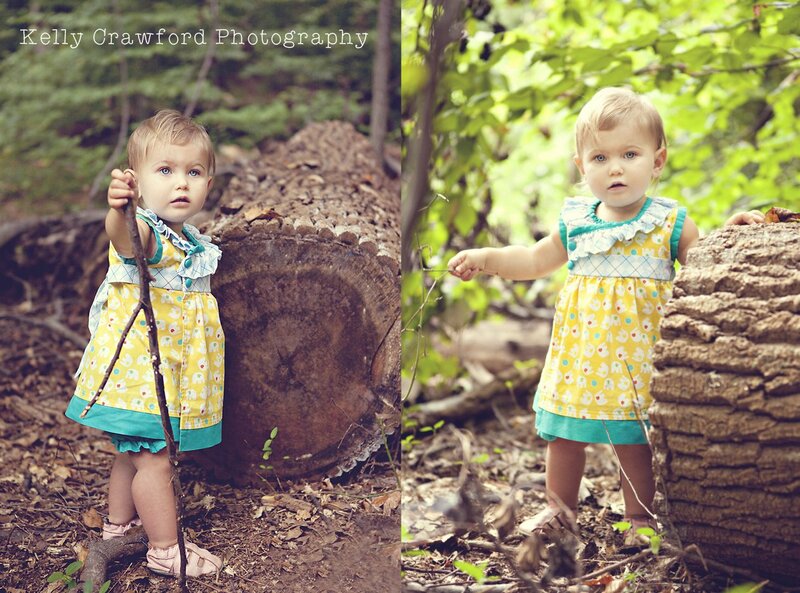 I will leave you with two shots from the session that I just adore. I really like the one with the stick. Wow! How cute is this!?! 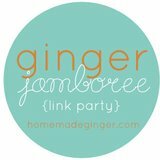 I will definitely be making two of these for my girls 🙂 Visiting from http://www.huckleberrylove.com I saw your link over at the Shine on Fridays link party.